Startling new interactive maps vividly show the depth and breadth of residential segregation in the U.S. at the state, county, census tract, and census block group levels in ways that most previous mapping has not. ADC forced to challenge another court decision allowing the City to withhold evidence -- this time evidence about its motivations and about alternatives to its policy. For all the recent outrage at instance after instance of well-known public figures being found to have engaged in sexual harassment, there has been surprisingly little discussion of any changes to the law that would affect the vast majority of victims of harassment who work in the civilian labor force. Unknown to most people, there is a judge-invented doctrine that throws must victims out of court. That doctrine says that harassment is not actionable unless it is “severe or pervasive.” But any state or municipality friendly to civil rights can throw that doctrine in the trash bin where it belongs. Pretending that the decree is basically on track. Ask court to consider fully the information and perspective offered by ADC and to order remedies proposed by ADC. New York City has disproportionate burden because its neighbors shirk their responsibilities. Preferences given in affordable housing lotteries help perpetuate City's intense levels of residential segregation. ADC study demonstrates the importance of listening to the varied voices of African-Americans and Latinos on affordable housing choices. Exploding the myth that most affordable housing seekers in highly segregated New York City insist on staying close to home. Majority of interviewees willing to consider affordable housing in another borough. Majority of interviewees willing to consider housing in a suburb of New York City. “The Monitor finds that the County is in violation of Paragraphs 7(i), (j), and 23” of the court order. Supplemental report focuses on failure to take required actions in respect to one development. Monitor still not seeking action on broader issues. 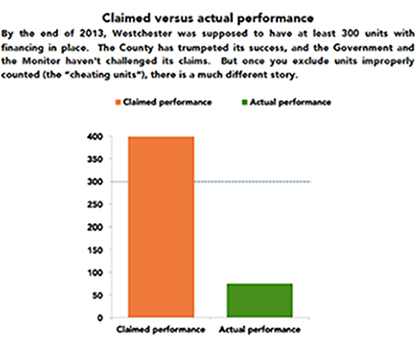 Latest status report does begin to cite subset of County's violations, but remains wedded to the false narrative that "progress" continues to occur and adds additional "cheating units." Window-dressing changes to zoning that leave vast single-family areas highly segregated and untouched by affordable housing are lauded. Westchester's six years of across-the-board refusal to challenge municipalities who retain barriers to fair housing choice not discussed. How about trying to enforce the consent decree directly after six years of continuing violations? Decision puts into sharp relief the U.S. Attorney’s unwillingness to demand full accountability. Governor Cuomo and Representative Lowey once again fail the test of providing civil rights leadership. Why don't they call for Westchester to be punished for its failure to comply with its court-ordered housing desegregation obligations? The reality is that, in most jurisdictions, citizens and officials like (or, at least, accept) their segregation the way it exists. Faulty premises about nature of problem yield faulty solutions. An effective rule can't assume cooperative jurisdictions. A requirement for practical actions steps still nowhere to be found. Failure to analyze different minority groups separately and focus on "clustering" instead of "segregation" among the problems identified. Monitor refuses to believe that HUD letter actually represents genuine or considered view of agency or U.S. Attorney; demands further "signal" from Government. Goodbye to a proper and robust “perpetuation of segregation” analysis; hello “perpetuation of clustering” only. A legal analysis true to established law would really rock the boat, so the Monitor made up his own, more limited, rule. Co-op boards: “If people knew why we make the decisions we make, our way of life would crumble.” That tells you a lot. Privilege? Check. Secrecy? Check. Unaccountability? Check. Breeding grounds for discrimination? You bet. Do you have a co-op horror story to tell? More civil rights groups have concluded that enforcement of the landmark housing desegregation court order entered against Westchester County five years ago has been entirely inadequate and are demanding that the Justice Department "alter course and vindicate the integrity of the consent decree." At court conference on Westchester case, U.S. attorney tries to excuse its failure to hold Westchester to account by suggesting that a defendant can shield itself from having to perform court-ordered tasks by denying the existence of facts staring the defendant in the face. Looking for the latest on the case against NYC's outsider-restriction policy in its housing lotteries? This fair housing matter affects the opportunity of hundreds of thousands of income-eligible NYC households to seek affordable housing where they want it on an even playing field, regardless of race or ethnicity. Consent decree "must be enforced completely and and enforced with passion and determination," says one. The housing to be built under the consent decree was intended "to be catalytic in impact," says another. More than six years after Westchester was forced to enter into a federal court consent decree requiring the dismantling of zoning barriers to affordable housing, very little is understood about the actual requirements of that decree. The confusion is evident in a recent editorial in the Westchester Journal News. Featuring a call to “finish housing settlement,” the Editorial Board is apparently not aware that compliance with the consent decree has barely begun. Another example of the wrongheadedness of the strategy of the U.S. Attorney and the Monitor to pretend that, in the main, the Westchester consent decree is on track. See what some of those standing with us in our challenge to New York City's segregation-perpetuating policy have to say. Westchester groups, fed up with inaction on affordable housing, seek action. 10 percent of 463 units of proposed new housing in Harrison should consist of affordable units, they say. County Executive reminded of his obligation to take legal action against municipalities who retain zoning barriers. ADC is looking to build capacity in the private bar to do this work. This project seeks to field potential cases from people with disabilities, assess those cases, and work with co-counsel to vindicate the accessibility rights that have been violated. Pedowitz & Meister and Vladeck, Waldman, Elias & Engelhard will field applications from Columbia 2Ls seeking to work this summer in the private practice of public interest law. The Lawyers' Committee, NAACP Legal Defense, and the Poverty and Race Research Action Council recently sent a letter to Jim Johnson, the Monitor in the Westchester case, challenging the rosy view of enforcement efforts presented to the Court by the U.S. Attorney and also criticized the Monitor’s intended method to assess the disparate impact caused by restrictive zoning in Westchester’s towns and villages. ERASE Racism lauds ADC as being a creative and tenacious trailblazer at annual gala. The University of Michigan Law School brought together scholars from around the country to discuss the state of Title VII jurisprudence and the civil rights landscape more broadly.